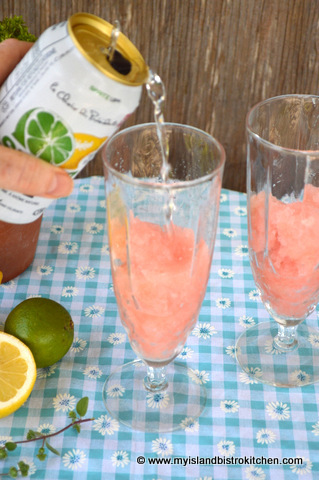 I love to develop summertime drinks! 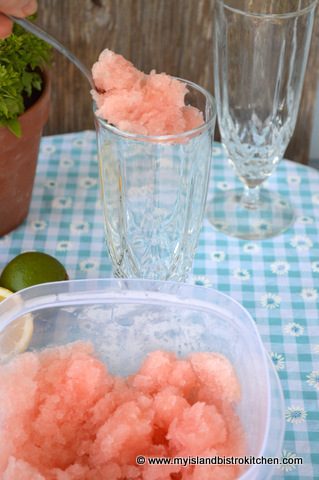 This recipe uses rhubarb as the base for this tasty slush drink. 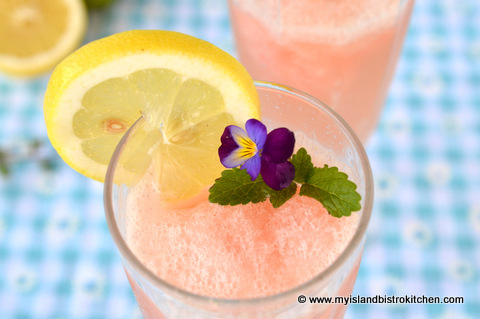 The addition of a mix of freshly squeezed citrus juices, sweet pineapple juice, and frozen lemonade concentrate make this a flavorful beverage. This is an alcoholic beverage as it uses gin. There is no fixed ratio of slush to soda but I generally fill a tall glass about a third to half full of the slush and top it up with a clear soda such as lemon-lime. 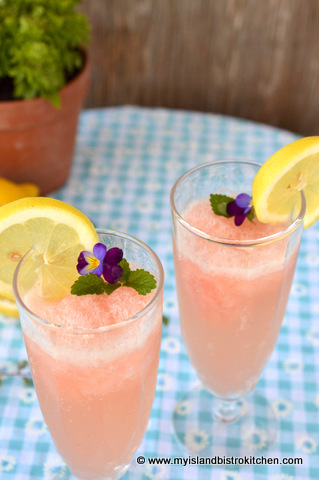 Serve with a lemon wheel or wedge and it’s a refreshing drink on a hot summer day. • Use the the brightest red rhubarb stalks you can find as this will give the slush color. • Use freshly-squeezed citrus fruit juices, not bottled (fresh is always best!). 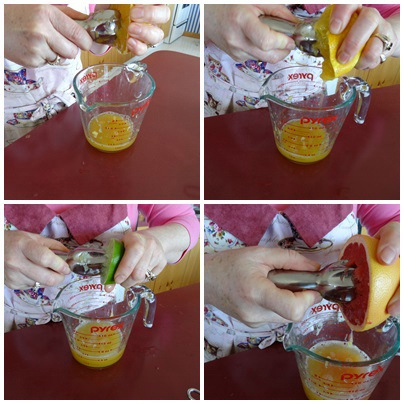 • Strain the citrus juices twice to remove all traces of seeds and fruit pulp. 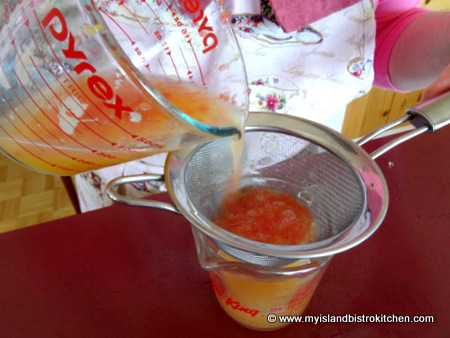 • Chill the rhubarb and citrus juices, pineapple juice, simple syrup, and gin. The colder the ingredients are to start with, the quicker and better the freezing process for the slush. 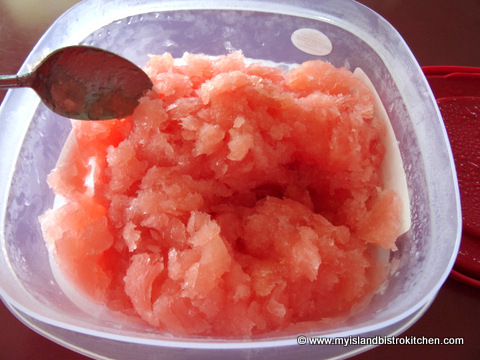 • Plan ahead to make this slush as it will take at least 2-3 days for it to reach the optimal “slush” stage. 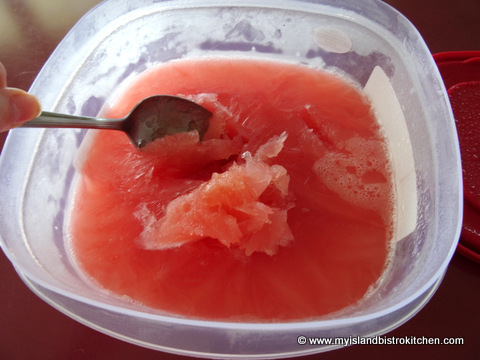 • Stir the slush 2-3 times during the freezing process to ensure ingredients remain mixed during the freezing stage. It will not freeze rock hard solid as it’s not meant to. 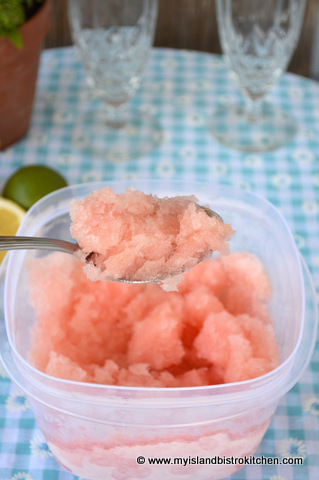 • For best results, store the slush in a tightly sealed container deep in a deep freeze (as opposed to a refrigerator’s freezer compartment). Otherwise, the slush may remain in a fairly liquid form and not freeze, and stay frozen, at the slush stage. 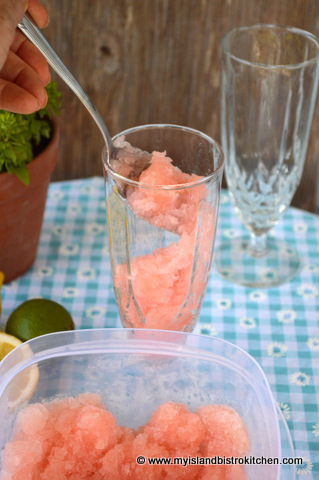 • Once mixed with the cold soda, serve immediately as the slush melts quickly. 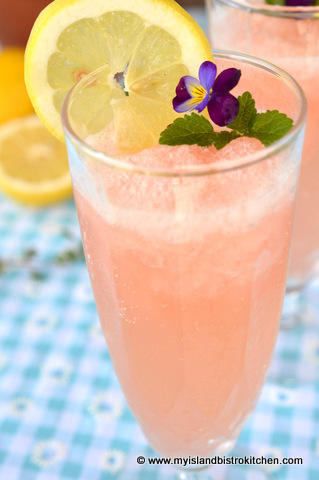 This is a pale, pastel drink that is packed full of flavour. 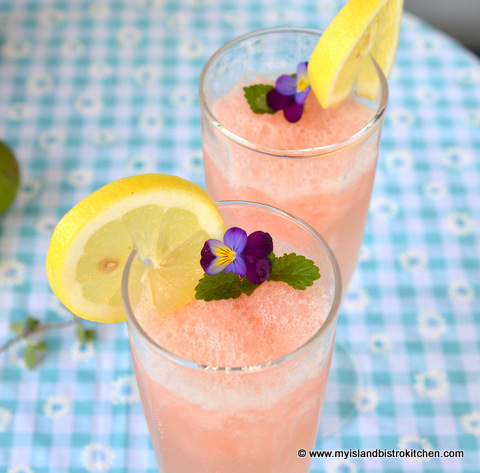 Sometimes, I add some lemon balm leaves and edible pansies to add color and interest to the drink. I think this would make a lovely bridal shower signature drink. In medium-sized saucepan, combine the 1½ cups water and 1½ cup sugar to make a traditional simple syrup. 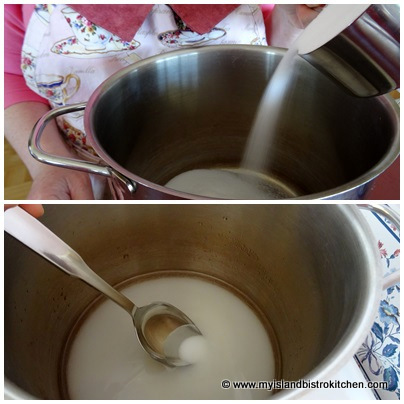 Over high heat, bring to a boil then reduce to medium-low heat and boil gently for approximately 4-5 minutes, stirring occasionally, until sugar has completely dissolved and liquid is clear. Remove from heat and let cool to room temperature, then chill. 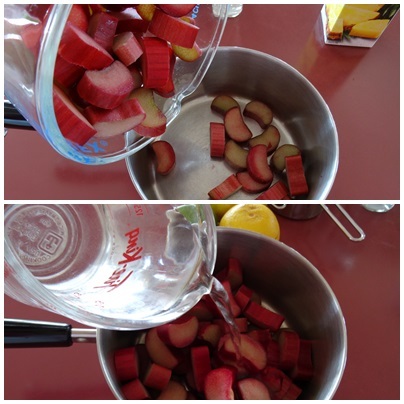 In medium-sized saucepan combine the rhubarb and 2/3 cup water. Bring to a boil over medium-high heat then reduce to medium low and cook gently for about 10 minutes until rhubarb is broken down into a soft sauce-like consistency. 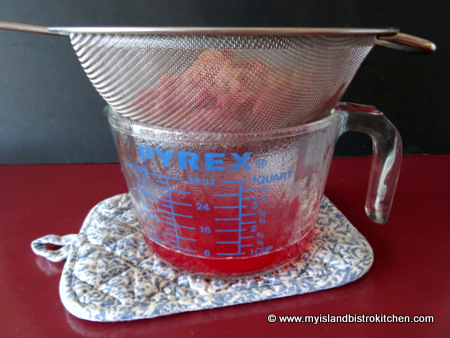 Pour rhubarb and its liquid into a fine sieve/strainer placed over a bowl or large measuring cup. Let juice drip from rhubarb, periodically pressing the rhubarb pulp with the back of a large spoon to extract as much juice as possible. This should yield 1 cup of rhubarb juice. Chill. Discard rhubarb pulp. Prepare the citrus juices and strain twice to remove any seeds and pulp. Chill. 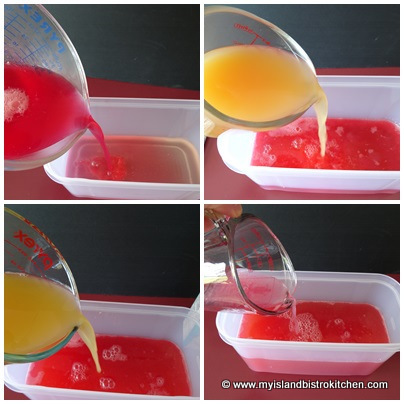 Into a freezable container that can hold at least 7 cups of liquid, pour the cooled simple syrup of sugar and water. 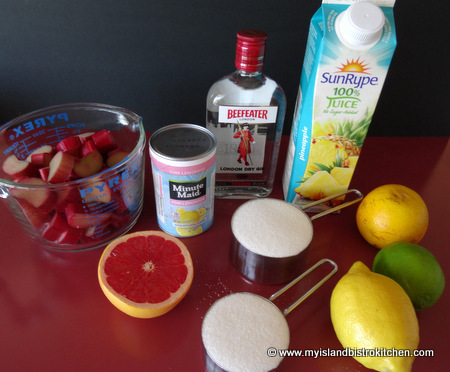 Add the chilled rhubarb, citrus, and pineapple juices along with the semi-thawed lemonade concentrate and the gin. Stir well. 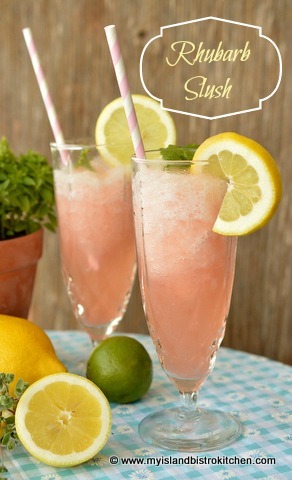 To serve, fill a tall glass about a third to one-half full of slush and top up with a clear soda, such as lemon-lime. Garnish with a lemon wheel or wedge and serve immediately. Decorate with a sprig of lemon balm and/or an edible pansy, if desired. Note: There may be some slight variations in colors between different photos in this posting due to different lighting used. 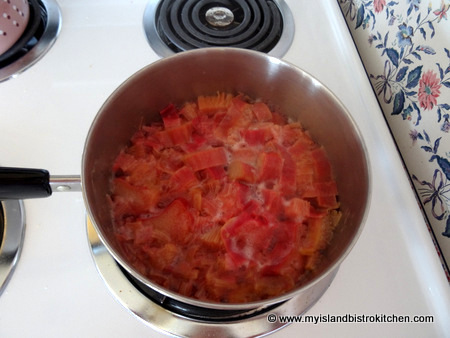 In medium-sized saucepan combine the rhubarb and 2/3 cup water. Bring to a boil over medium-high heat then reduce to medium low and cook gently for about 10 minutes until rhubarb is broken down into a soft sauce-like consistency. 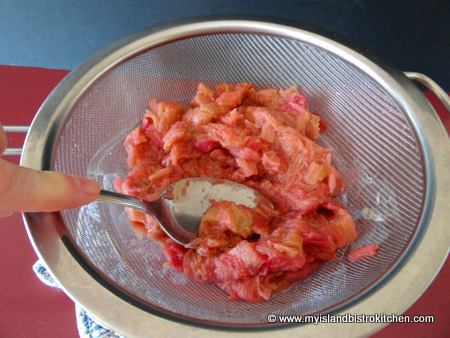 Pour rhubarb and its liquid into a fine sieve/strainer placed over a bowl or large measuring cup. Let juice drip from rhubarb, periodically pressing the rhubarb pulp with the back of a large spoon to extract as much juice as possible. This should yield 1 cup of rhubarb juice. Chill. Discard rhubarb pulp. 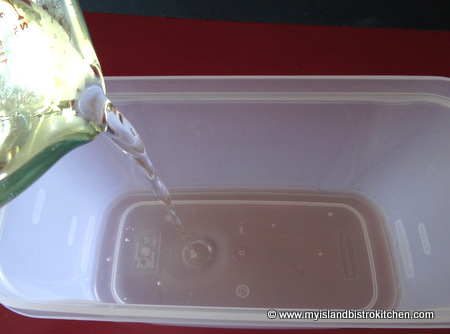 Into a freezable container that can hold at least 7 cups of liquid, pour the simple syrup of sugar and water. 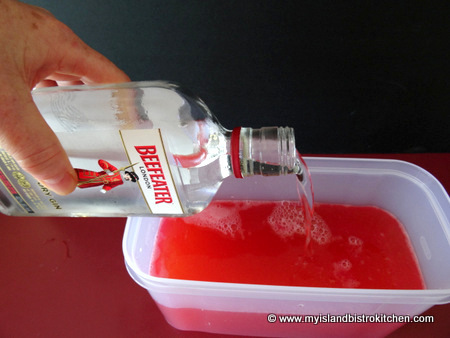 Add the chilled rhubarb, citrus, and pineapple juices along with the semi-thawed lemonade concentrate and the gin. Stir well. 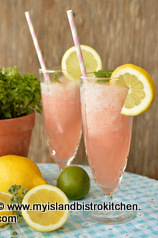 To serve, fill a tall glass about one-third to one-half full of slush and top up with a clear soda, such as lemon-lime. Garnish with a lemon wheel or wedge and serve immediately.